Drying wood is just as much an art form as it is a science. Drying takes lots of adjusting, monitoring, and usually takes a very long time. Below are a few guidelines and hints that I have used in the past. Wood is only going to dry if you create an indoor environment that is drier than the moisture content of the wood. Control/Create the drier interior environment with dehumidifiers, electric supplemental heat, and air movers. Remove all moisture sources - water inside toilet bowls and tanks, plumbing traps (air seal), keep all doors and windows closed, and air seal any ceiling and/or attic penetrations. If operating the central AC - prevent all condensation of cool surfaces, repair all duct leaks that create differential pressures and/or add moisture to the indoor environment. Read and record moisture content of the wood and/or OSB (Oriented Strand Board) sheathing with hammer type drive pins - measure at three different depths (inside surface, middle, and outer edge). 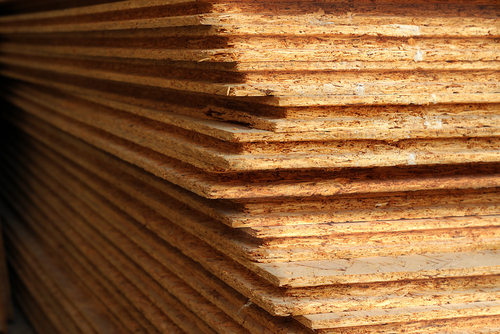 The moisture content target is 15% or less of the entire thickness of the wood products. OSB takes twice as long to dry as dimensional southern yellow pine wood. Never measure moisture more than once in a set of pin holes, always measure at an adjacent location. Make certain that drain lines for the dehumidifiers are sloped properly and are removing as much condensate as possible. The goal is to create a warmer drier interior environment that will allow moisture transfer from the wood to the indoor air. However, you must find a balance that allows drying, but not too fast to cause cracking and checking of the remaining wood millwork/trim that was uneffected by flood waters. Depending on the type and location of the framing member either the center of the wood or the outer outside edge will take the longest amount of time to dry to 15% moisture content. If the moisture content of the flood damaged exterior wall sheathing is 15%, at the interior surface, than the center and outer edge will be much greater, likely 20-30%. If mechanical drying is ceased before reaching the overall target of 15% then the MC of the drier segment of wood will increase due to the moisture finding an equilibrium within the wood. Thermodynamics principles work and are constant, just like gravity!